We offer several payment option: We accept credit card payments, full-payment, and payment plans for those who meet our requirements. There are low interest loans or Student Loans available through Wells Fargo, call for details. 619-477-7724. 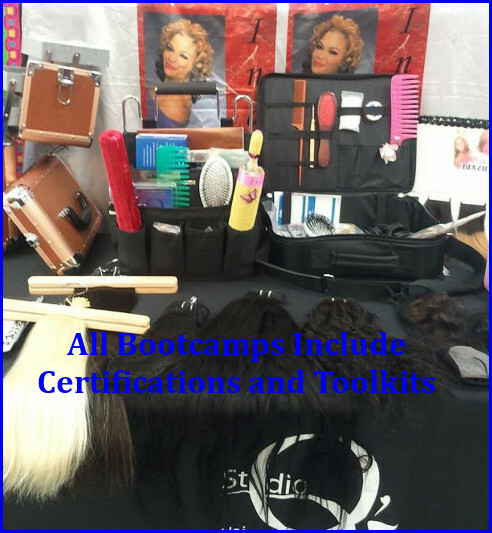 All camps come with certifications and kits. LaQue's Corporate Training Academy's classes come with supplies and certificate after completion. For Fusion, a fusion hair extension machine is included for example. We teach extensions at all levels! You do not need a license to learn hair extensions. It is preferred, since you will probably learn faster. Please note in your home state, you will need a license to touch and work on people's hair. There are low interest loans or Student Loans available through Wells Fargo, call for details.PH. 619. 477.7724. We teach all levels. From beginner, intermediate, and to advance, we work at your pace. Are you a beginner, and want to learn hair extensions slowly? Are you advanced, and want to be the best? We can help! All training is based upon you and it is one on one. We have all levels of hair extension training classes. Our class prices are based on the quality of instructions, from a reputable continuing education academy. We charge $2000/Complete Course or $250/per class for 8 hours per day Bootcamp per topic you want to learn, or what you want training on. We also teach the above hair extensions training classes if you like. Each is a one day class. Pick the topic you are interested in. If you choose the complete course, normal hair class charge is $2,700 but we give you a special deal $2000 and you save $700. Think of it as an investment in yourself! You can make back the training costs in 1-2 hair extensions! Get a certificate after the training from LaQue's Corporate Training Academy! The best thing is the support we offer you after you learn hair extensions with us. You can buy hair, hair extensions, and hair units from us at wholesale pricing! That is worth the cost of the hair extensions training class all by itself! There are many different places that offer hair extensions training classes. Why learn hair extensions from someone who doesn't know anything, or who never made any money in the business. Learn from the best. We are located 933 Highland AV, National City, CA 91950/ PH.619.477.7724 ACADEMY/ FAX619.477.7001/ TOLL-FREE 866.851.4710.You can fly in from anywhere in the USA or the world, take your training, and then go back home.